Written by John Gardiner and Fiz Coleman, with music by Andrew Parr, and presented in associated with Samuel French Ltd. The Wild West musical is fun for the whole family. The action takes place on Christmas eve in Diamond Tooth Lil's Saloon where all are busy with preparations for a Christmas party. Word comes that a badman and his gang are headed their way. It seems Diamond Tooth Lil helped the bad guy in a robbery years before - and he's coming for the diamond she has! 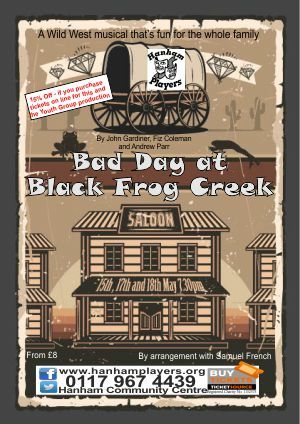 Written in 1978 but set in a Saloon in the Wild West of the 1880s.